Everyone who trains for a triathlon wants to get faster, but how do you know if your training and nutrition are aligned with what your body actually needs? I’ve written previously about the variations we see in fat burning and running economy, now I want to talk about how these variations actually translate to nutrition recommendations. During exercise, we get our energy by burning a mix of carbohydrate and fat (protein contributes a small amount, but it doesn’t have a large impact within this discussion). 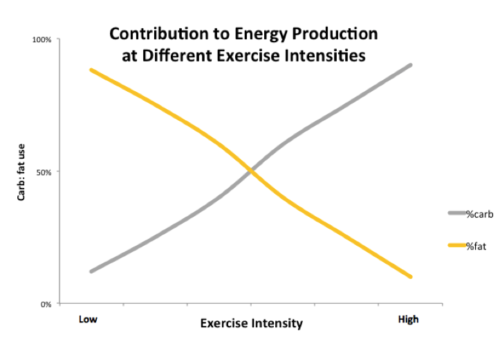 There are times when we want to burn more fat (low to moderate intensity exercise), and there are times when we want to burn more carbs (higher intensity exercise). This is an important note, burning more fat is not always better! This is an important note, burning more fat is not always better! First let’s look at a textbook example of carb and fat burning. As exercise intensity increases, so does your reliance on carbohydrate. There are several reasons for this which are beyond the scope of this article, but one of the most important things to know is that carbs require less oxygen to be burned compared with fat. What is in precious demand during endurance exercise? Yep, oxygen. Some people try and increase fat burning as much as possible, but I see this as a very big mistake for athletes who are trying to go as fast as possible. In short, because when oxygen is in great demand, why would you want to use more of it (by burning fat) to go the same speed? So how do we know if we’re burning the right amounts of fat and carb? Luckily there is a way to measure this, and we can use these test results to shape your nutrition plan. Here is an example of a very good recreational triathlete, who is always in contention for a podium spot and keeps getting better and better all the time. You might notice that this looks quite different than the “textbook” carb/fat burning. 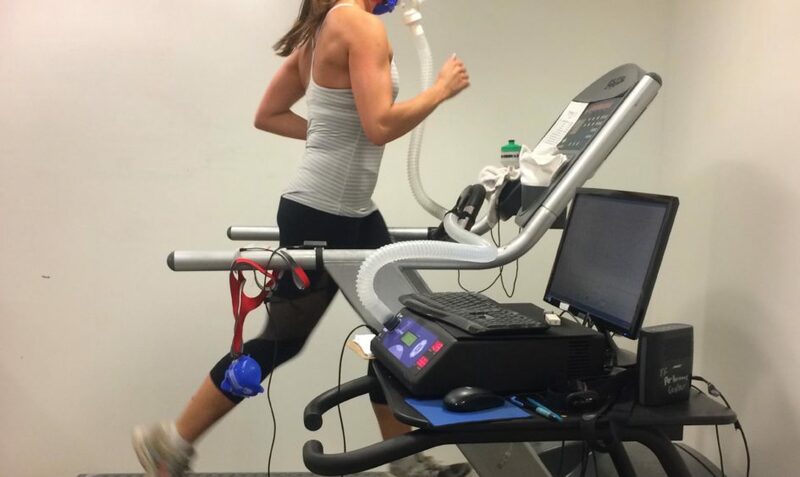 After performing hundreds of tests on everyone from Olympians to people who are completely sedentary, I can tell you there is a huge variability in people’s ability to effectively burn both fat and carbohydrate. In the scientific literature this is referred to as “metabolic flexibility”, and being able to effectively use both fat and carbs is a good thing for both health and athletic performance! When I look at this graph, a few things stand out to me. I see that this is clearly a good athlete, but they’re not great at burning fat in the low zones or burning carbs in the high zones. They also probably do a lot of their training in the “middle” zones (that hard-but-sustainable effort that many people find themselves in much of the time). Let’s take a closer look at a few areas of this graph…. 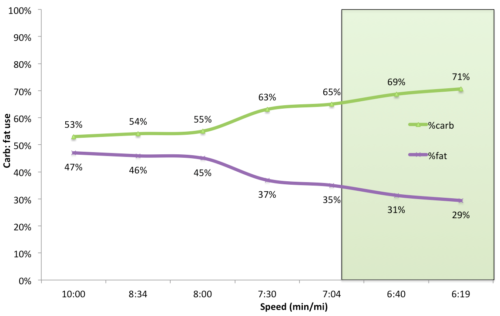 A hallmark of a well-developed aerobic capacity is the ability to burn fat during low to moderate-intensity exercise. 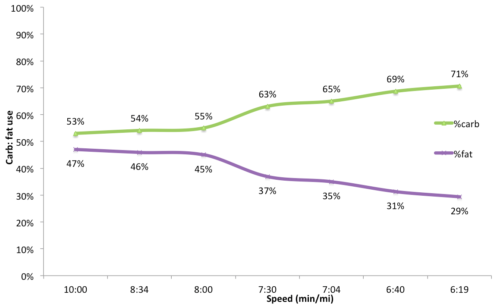 For simplicity I left heart rate and oxygen consumption off this graph, but I can tell you that an 8:34 min per mile pace for this athlete equates to about 60% effort. This is where they should be burning a higher percentage of fats and saving their carbohydrate stores. We can come up with a few recommendations based on this test result. Training recommendation: Spend more time in the low zones to build an aerobic base. It’s not always fun and doesn’t feel hard, but will be helpful (if not integral) as a part of the longer term athletic development. I want to emphasize that we are not trying to be better at fat burning just for the sake of burning more fat, but rather, we can use this as an indicator to see how well-developed this part of the system is. Nutrition recommendation: Use strategic carbohydrate manipulation to undertake some of these low-intensity aerobic training sessions with a low gas tank. That means either doing them in a fasted state, or as a second workout of the day when they may be in a slightly depleted state. Depending on the length of the workout, electrolytes and protein intake may be beneficial, but that is something we determine on a case by case basis. Again we aren’t trying to just burn more fat, but doing workouts in the fasted state can have different effects on the enzymes that lead to mitochondrial improvements as well as increased fat burning. 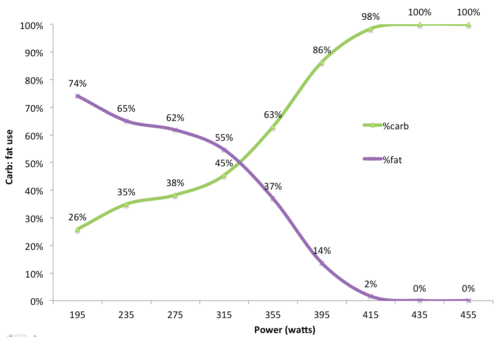 Now let’s look at the top end, and we see they are burning a ratio of about 70:30 carb:fat. Again some people might rejoice at these numbers, but it’s bad for optimal performance. There is a key enzyme involved in carb burning that has likely been downregulated (e.g. use it or lose it) from too many workouts performed in the fasted state or by chronically underfueling. It could also be down from a lack of high-intensity workouts. Training recommendation: Include high intensity workouts that include adequate rest and recovery between efforts (e.g. interval workouts). Nutrition recommendation: Consume adequate carb intakes before and/or during high-intensity workouts. The specifics of what defines “adequate” needs to be considered on a case by case basis, but in this case likely any amount “more” would probably be better. Does anyone actually have a textbook curve? Perhaps not surprisingly, I’ve found the best and most successful athletes usually have more well-developed systems. 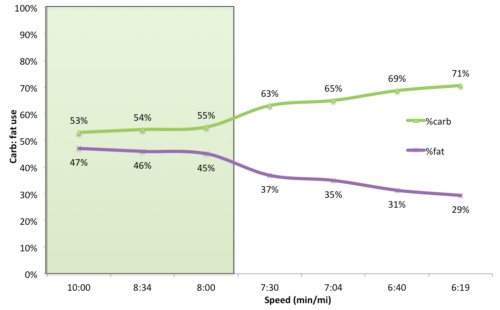 Here is one example, and anyone familiar with cycling power outputs could attest to the level of this cyclist. We see a well developed fat burning system and a well developed top-end carb burning system. This is optimal when trying to win races, and any suggestion that this athlete would be better off by shifting the cross-over point to the right would be misguided, in my humble opinion. Following basic carbohydrate periodization is likely a sound approach for most athletes, but having this data allows for a more empirical look into what’s going on in your body during exercise and in turn more specific recommendations for training and nutrition. If you live in LA and want to have this testing done, you can contact me. If you live outside of LA and want help finding a place to do this test so we can discuss the results together and put together a nutrition plan, also feel free to reach out!